Home to some of the world’s best-known ancient architectural treasures, Rome is rarely celebrated for its modern buildings. But, as of late last year, there is a new jewel in the crown of Roman architecture; after 18 years of meticulous planning, the Rome-EUR Convention Hall and Hotel has finally opened its doors for international conferences. 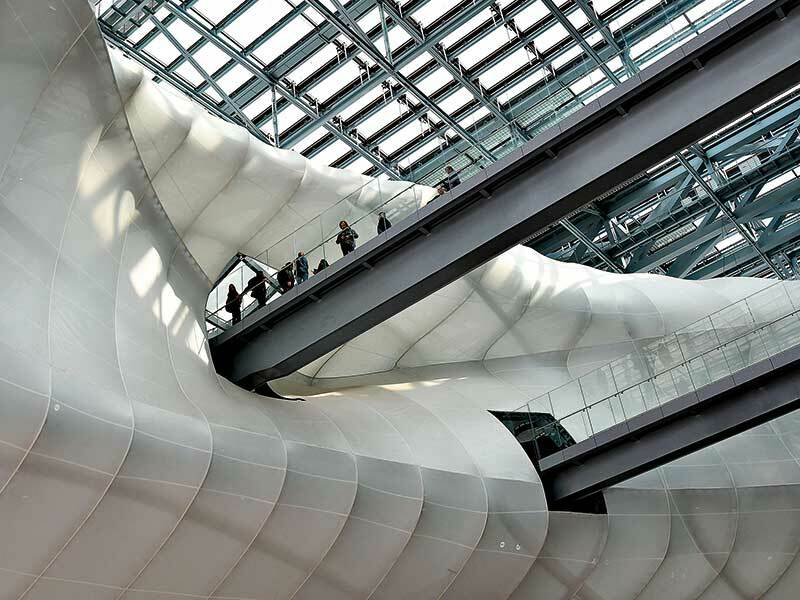 Dubbed ‘the Cloud’, the centre’s mix of grandeur and practicality will enable Rome to compete on the international conference circuit, bringing a brand new, high-end convention destination to the heart of Europe. The new build’s innovative design was dreamt up by renowned Italian architect Massimiliano Fuksas, who describes the concept as being defined by three elements: a theca, a cloud and a blade. The theca is a vast glass outer shell that forms the exterior of the building. Enclosed within is a swirling cloud-like structure, comprising ribbed steel and covered in a 15,000sq m translucent curtain. The overall effect is akin to a cloud suspended in an enormous glass box. The final element of the construction, the blade, is an autonomous structure lying adjacent to the theca-enclosed cloud. It is home to 439 hotel rooms, as well as seven boutique suites, a spa and a restaurant. While spectacular from the outside, the real showpiece is the elaborate and somewhat surreal space inside the Cloud itself, which has been fitted with an auditorium capable of hosting up to 1,800 people. The conference centre has a total capacity of nearly 8,000 seats, and each space is designed to be adaptable, allowing the Cloud to accommodate a range of events, from lectures and large conferences to exhibition events. As a result, Enrico Pazzali, the head of EUR Spa, the public body behind the project, has said he fully expects the centre to play host to around 300,000 people every year. cultural attractions. Conference goers will no doubt be tempted by Rome’s historical delights, and will be able to take leisurely trips to popular draws like Vatican City or St Peter’s Basilica. While close proximity to Rome’s most famous attractions is certainly a plus, there is also something to be said for exploring the EUR district itself, which is steeped in its own peculiar history. The district was built to house the World Fair in 1942, with then-Prime Minister Benito Mussolini hailing it as a grand celebration of 20 years of fascism. Of course, after the war ended, the World Fair would never take place, leaving the district’s 1930s rationalist architecture only partially completed. Today, EUR is a thriving business district with numerous hotels and corporate events spaces. And, with its new state-of-the-art convention centre up and running, EUR visitors will struggle to remain grounded with their head in the Cloud.